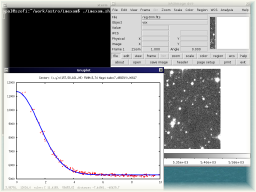 Welcome to the web page of the FITSH package, an open-source software collection related to astronomical image and data processing. This page gathers information about the program (including documentation and examples), this is the primary download source of the package itself, and additionally, serves a public forum for the program users in various topics. Mainly, the documentation and examples related to FITSH are maintained as a set of wiki pages. See this page for an introduction of the concepts of the FITSH package and data structures used by this software. 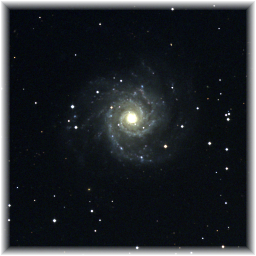 Basic information about the images or other FITS data, pixel statisitics. Conversion of FITS images to more easily presentable formats. Querying and modification of FITS header keywords. Calibration of raw images, including the masking of bad, saturated or otherwise unuseable pixels. Arithmetic operations on images, both on per-image and per-pixel basis. Combination of multiple images into a single one. Generic spatial geometric transformations of images (shifting, dilating, shrinking, clipping, higher order polynomial transformations, ...), including the registration of images to the same reference frame. 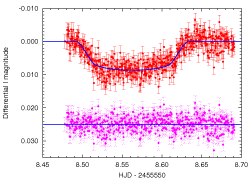 Detection and characterization of stellar profiles. 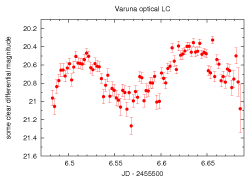 Photometry (aperture, image subtraction, analytic profile modelling, PSF and various other sophisticated combinations of these). Regression analysis and general numeric data manipulation. Very simple way of parallel processing, using the pexec utility (that is available also as a GNU/Linux package as well, on recent distributions). procedure. Alternatively, on dpkg-based GNU/Linux systems (e.g. Debian, Ubuntu), you can create a DEB package and install FITSH using your favourite package management tool. You may find more details about the installation steps here. See also the full changelog of the package (since the version 0.9.0). Here we refer to our ``getting started'' section. This section also contains a brief description of other optional software packagesthat can be useful while using the FITSH package. All of the programs/tasks are capable to provide a shorter and a longer list of command line help options and description that are available via the --help and --long-help options, respectively. The --help option simply lists the available options and switches with a minimalistic references of the actual syntax while --long-help gives a more detailed description. You can find a more detailed summary about the specific programs/tasks here. There is an all-in-one document in PDF format describing the above mentioned options and features some examples as well. See also the ``Examples'' section of this web page. Please provide feedback if the documentation seems to be incomplete and/or incosistent. User contributions are also welcomed! If you find a bug, you can either submit a report or provide a patch if the solution for the bug is known. Don't forget to provide some information about the host operating system and attach the essential files which cause one of the program to fail. Please be as terse as possible. The most effective way is to send a single tar or tar.gz file that contains the essential data files and a simple minimalistic shell script that produces the unexpected behaviour if started. This program is distributed in the hope that it will be useful, but without any warranty; without even the implied warranty of merchantability or fitness for a practical purpose (an excerpt from the GPL). The content of this web page is copyrighted by András Pál, unless explicitly noted. If you find this program useful in your research, please cite this paper, as something like ``Pál, A. 2012, MNRAS, 421, 1825''.